(The moustache is a reflection of pride. A man who doesn't have a moustache does not have any pride). Remember this famous dialogue of eminent actor Utpal Dutt, who played a moustache obsessed character in Hrishikesh Mukherjee’s hit comedy film GOL MAAL. In the upcoming films Shah Rukh Khan spots a thick moustache in RAEES and Salman Khan too spots a moustache in PREM RATAN DHAN PAYO. But in both the films the actors play a double role and Bollywood is known for differentiating twins by a moustache! However in reality moustache in Bollywood is a big NO for the heroes, if you do not believe check out all the top stars of Bollywood from the 50’s to 2015, a majority are without moustache. From Dilip Kumar, Dev Anand, Rajendra Kumar, Shammi Kapoor, Sunil Dutt, Dharmendra, Shashi Kapoor, Rajesh Khanna, Amitabh Bachchan, Rishi Kapoor, Mithun Chakravorty, Sunny Deol, Sanjay Dutt etc. Even the trio Khan viz. Salman, Aamir and Shah Rukh Khan are without moustache. The recent crop of actors, too continue the trend of being ‘minus moustache’. Ranbir Kapoor, Varun Dhanwan, Rajkumar Rao, Hrithik Roshan, Sushant Singh Rajput etc. 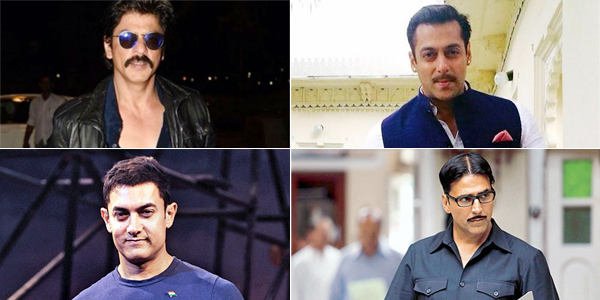 It seems the reason why Bollywood heroes do not spot a moustache is probably because it portrays an elderly look! If you are a Bollywood buff than you must have noted that whenever a hero is given an elderly look in films then the first thing that the director does is giving them a moustache. Remember the recent hit BADLAPUR, in which Varun Dhawan is given a moustache and beard to make him look aged. Likewise there are many films like Shah Rukh Khan in CHAK DE; Akshay Kumar in SPECIAL 26. There have been exceptions in Bollywood who spotted a moustache and became hit like Guru Dutt, Raj Kapoor, Shatrughan Sinha, Raaj Kumar sported a moustache. Stars like Jackie Shroff and Anil Kapoor up the trend well into the 90s. But in nutshell most heroes have preferred to be clean shaven.